I wanted to see the ruins of Petra for a long time. But I wanted to make it a larger trip through the sites of the Middle East. The conflict in Syria prevented me to do this trip. After Palmyra was lost, I decided not to wait any longer. Jordan has been a very stable and progressive country under King Abdullah II, but the future is uncertain. Limiting the trip to Jordan made it a bit shorter, but also easier to fit into a normal vacation. After having made this journey, I can clearly say that Jordan is a very liberal and progressive country. It is also perfectly safe, except for crossing the streets. We have met some very friendly locals and have always been treated with respect and a smile. Everyone asks where we came from, but only to reply “welcome, welcome”. The trip started with a very long travel day with a stop in London. We finally arrived rather late at our Amman base, the Hawa Guest House in downtown Amman. We booked the premium room with ensuite bathroom, but ended up with the even larger family room. It is a very lovely bed & breakfast with very friendly and helpful owners and lots of cats for entertainment. After a way too short a night we set off to explore downtown Amman on foot. Amman is built on a bunch of hills, which is represented in the names of the various neighborhoods. We were in Jabal Weibdeh. Jabal meaning mountain in Arab. First down tons of stairs to climb them back up on the other side to the Citadel. From there you have great views of downtown Amman. The citadel is a mix of buildings from Roman times forward. It has been constantly rebuild throughout the history of Amman. A small archeology museum completes the site. From there we went down all the stairs to the Roman Theater. It is still in very good shape, but somewhat isolated as nothing else from that time has survived nearby. Somewhat tired we tried to get back home, but as we tried to cross the road, I inadvertently hailed down a cab. Since it was there, we decided to take it to the just recently opened Jordan Museum. It was well worth it. The museum seems to not be quiet completed just yet, but is very interesting even now. They even have pieces of the Dead Sea Scrolls. That was a very nice and unexpected bonus. Now knowing how to hail a cab in Amman, I got us another one for the way back home. Traffic in Amman is a bit on the crazy side and I did not really want to navigate it. So we hired a very friendly driver called Osama. This day we went to the northwest of Jordan. First stop after a 2 hr ride was Umm Qays, a quaint little Roman settlement with attached Ottoman village. There are nice views of the Golan heights and the Sea of Galilee. Next we continued on to Ajloun castle, a still very impressive castle on top of the city of the same name. It was built during the crusades to fend off the crusaders. It is in remarkable condition and offers gorgeous views of the surrounding lands. Final stop was the huge Romand city of Jerash. It is now completely surrounded by the city, which detracts a bit from the ambiance. The Main Street, starting at the Oval Plaza, is still fairly intact and an awe inspiring sight. Unfortunately, the city is littered with sellers. That was a sign of things to come at the main tourist spots. Unlike many other places, the sellers are not overly pushy, though. The night was then closed with a take-out pizza before we crashed early. After visiting the northwest, today was a trip to the east to view some of the desert castles. Unlike the lush hilly and forested western part of Jordan, the region east of Amman is really a desert. First stop was Qasr Karanah, a nice, almost fully intact structure in the middle of the desert. It is not quite known what this was built for. It is certainly not a castle in the strategic sense. It is more likely that this was a meeting point in times past. The second stop was Qasr Azraq in the town of Azraq. This castle is pretty run down and its fame to claim is that it was the headquarters for Lawrence of Arabia. This at least was a real castle. The last stop was Qasr Amra, which is not a castle at all, but a small bath house. It is in very good condition and a great museum piece. Everything from the water well, water pump (rather elevation system) and heating system is still there. It also houses beautiful frescoes which earned it a place on the UNESCO World Heritage List. The frescoes feature a sky chart with all the constellations and pictures of gods and even some more naughty images. Having spend some time in Amman, today we started going south. After receiving our car at the guest house, I somehow managed to leave Amman without causing an accident. Driving in Amman is rather challenging and not relaxing at all. Our little rental car bears the marks. It had more dings than straight sections. It was a beater for sure, but it was cheap and was delivered to the front door. Only one stop was planned for today, Madaba. That city is famous for its ancient mosaics. And they are truly impressive. We lucked out in that is was really slow and one of the museum employees spend some time showing us the various mosaics and even letting us in the closed off sections for a close look. After that quick cultural experience, we continued on to the Dead Sea and a bit of a luxury retreat. Floating on the Dead Sea is quite interesting. With a density of 1.24, one does not really float in it, but rather bobs on the surface. The water is very salty and rather bitter (yeah, I had to try) from all the dissolved minerals. Also, thanks to rather rapid evaporation, the Dead Sea is disappearing and so the beaches are all about 10 ft above the water line. In order to get to the water one has to walk over some sharp rocks. My feet still bear the marks of that experience. Now to the longest drive of trip. After winding the hillside back up to Madaba, we followed the Kings Highway to Wadi Musa. One stop a long the way was Al Karak Castle. It was a castle used by the crusaders and is still very impressive. We involuntarily got a guide, who we just could not get rid of. At least he did know what he was talking about and it helped making sense of the various rooms. After that visit we continued on some very long hours on the road. While the Kings Highway has some nice stretches, for the most part it is just a crazy drive through congested little cities. I would not recommend it, but in retrospect it is still nicer than the desert highway. Today was the first of two days of hiking in Petra. The day started with rain and very low clouds. It did not look very promising, but we ventured out anyway. The way into Petra is through the Siq, a narrow and deep slot canyon. Eventually it opens up and one stands in front of the Treasury, a gorgeous structure hewn into the face of the mountain. 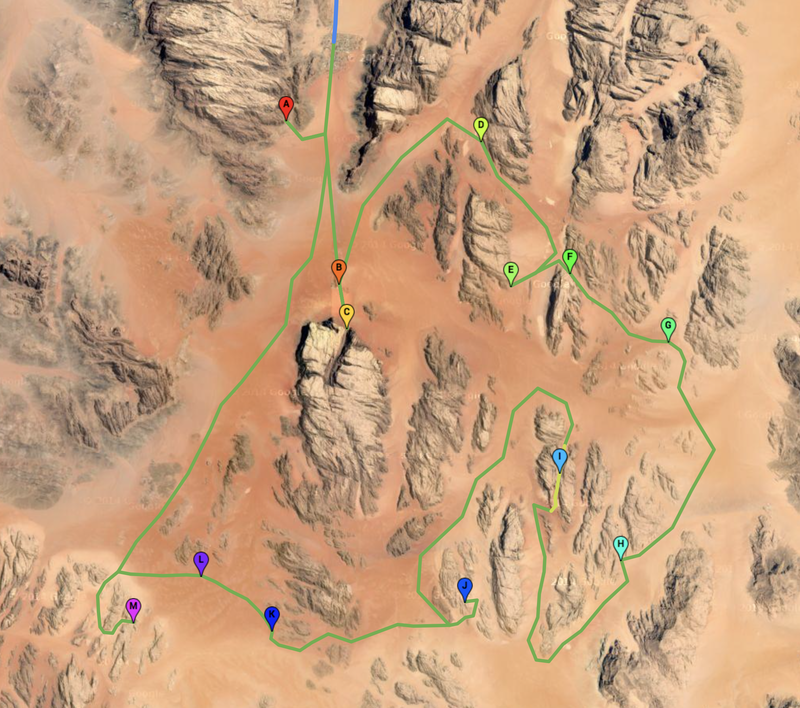 All structures are that way in Petra. Nothing is build by adding material, it is always by chiseling out stone from the mountain. The Nabateans were amazing at that. We started the real hike up 100+ meters to get to the high place of sacrifice. Along the way I had to pay a sacrifice of my own when my camera clip let loose and my camera took a hard hit on the stone steps. Fortunately, only the door to the battery compartment broke and a little bit of tape fixed that. The gods seemed to like my sacrifice and the sun came out once we got to the top. From up there one has a phenomenal view of Petra. What is most amazing are the two obelisks. Normally, they are blocks of stone stacked on top of each other. Well, not here. Here they removed the whole mountain top to leave the two obelisks behind. We made our way down along then back route. All of a sudden there was nobody there and we had that entire valley for ourselves. Except for a very friendly and hungry little cat, that is. We passed the lions sculpture, which was a water fountain and ended up in a valley with stunning colors of sand stone and a couple tombs. We ended the hike with a quick stint up to the urn tomb and then out the main way stopping at the theater. Later that night, I went back into the Siq for an event called “Petra at night”. There they light up the Siq with lanterns. At the treasury a musician plays some traditional instruments. I decided to hang back and had the Siq all to myself, an awe inspiring sensation. The sky completely cleared up and I listened to the music under a star filled sky. My legs and bum are sore, though. Second day in Petra. Today the goal was the Monastery on the far side of the park. After a slow hike through the Roman city center, we arrived at the museum, which was closed unfortunately. At this point it went up again. Since it was still early in the day, I had the 200 m elevation and 800 steps all for myself. Except for stands selling stuff all along the way. I must have surprised the sellers, because they were all still eating breakfast and so insisted that I had tea with them. I think these were honest invitations rather than a ploy to sell, because they really did not push any sales. Instead we had a couple minutes to chat about life and the lack of tourists this year before I thanked them and moved on. The tea was very good, though. Once on top there were only about 5 other tourists and I could take all the pictures I wanted. It is quite impressive to see these huge facades hewn out of the face of the mountain. And then there is only a single small room inside. After hiking back down, I slowly returned via the Byzantine church with beautiful mosaics to the royal tombs. There we then spend a bit of time climbing all over the place. I am surprised they let you do that, but it is fun. Some of the steps have seen better days and are a bit on the hairy side, but well worth it. After all the hiking, my legs were quite happy to know that today was a car day. After an early morning departure, we arrived in Wadi Rum in time for a day of exploring this gorgeous desert landscape in a Jeep. We arranged for a tour with Bedouin Directions, whom I can highly recommend. The trip starts with meeting with the owner at his house to securely park the car and move our luggage to the 4×4 they provide. All the driving is done by a guide, so we could enjoy the sights. There were quite a few stops along the way and most offered an opportunity to go out and hike a bit. First stop was Lawrence Spring, although there is a bit of an ambiguity about it. There are two springs, Abu Aineh and Ain Shalaaleh, the second being the actual Lawrence Spring. I am not sure which one we went to, but it was a nice scramble up the boulder field and a beautiful view. Along the way we stopped at a couple sand dunes, ancient petroglyphs and funny shaped rocks. Of mention is Um Frouth Arch, a small arch with a very steep side that can be hiked up. Although I am not sure if hiking is the right term here. It is more of a scramble on all four type thing, but great fun. Sometime around noon we stopped for lunch and Mohammed, our guide, cooked a stew on a wood fire on the spot. It was delicious and authentic. After a few more stops, we ended up at the Chicken Rock to enjoy the beautiful (but cold) sunset. Finally, we ended in the camp. It is set in a small hidden niche in the desert and comprised of a couple tents that serve as bedrooms, a main tent which is the reception/dining area and a shower/restroom building. The main tent had a fireplace which was very welcome as it had gotten rather cold by now. Dinner was a traditional Bedouin BBQ, which is cooked underground and was very good. All is served with the ubiquitous sweet tea. At that point I had to hike out a couple minutes to get cell phone reception so that I could check if our hot air balloon ride was going to happen the next day. Unfortunately, it was not due to wind. However, I found a nice place in the desert to take night photos and it so happened to be perfectly oriented with regards to the Milky Way that night. So around 2:30 am I was up again to take some photos of the night sky. I would highly recommend to take a star chart app with you to explore and enjoy the stars. Since the hot air ballon did not happen, we decided to go to Aqaba to take a quick look at the Red Sea. A quick look is really that is needed of Aqaba. There is simply not very much to see in this city. We went to the old fort and strolled along the seaside a bit. That about concluded the sightseeing in Aqaba. The last part of the trip was a very long 5hr drive along the Desert Highway back to the airport. Turns out the highway had more potholes than the dirt roads in Wadi Rum, so it is a bit slow going.